OPINION: Tom MacArthur talks bipartisan gun safety, but votes against it. Editors note: Pictures of the entire mailer are at the bottom of this letter. 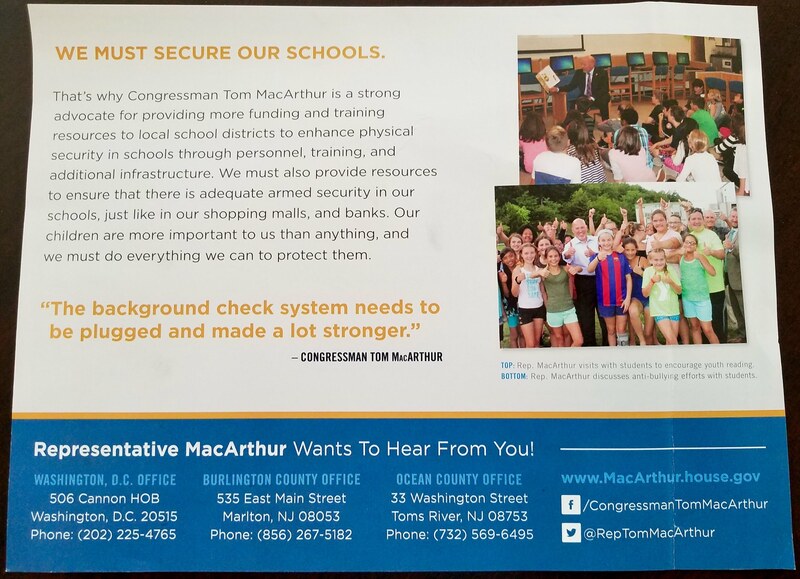 I am a constituent of NJ District 3, and just received my latest political mailing from the Tom MacArthur reelection campaign. While I can barely contain my revulsion at seeing this in my mailbox, I am also compelled to point out some of the outright falsehoods contained in this mailing. Rep. MacArthur makes a career of talking out of both sides of his face, with apparently neither side aware, or caring, of what is being said by the other. The mailing is predominantly focused on gun control issues. It states that he supports enhancing background checks and “the Fix NICS Act,” ostensibly for the purpose of ensuring (quote from mailing) “…that guns don’t make it into the hands of unsafe people.” Despite this, he has voted along Republican party lines to allow the mentally incompetent to both purchase and carry concealed weapons across state lines. 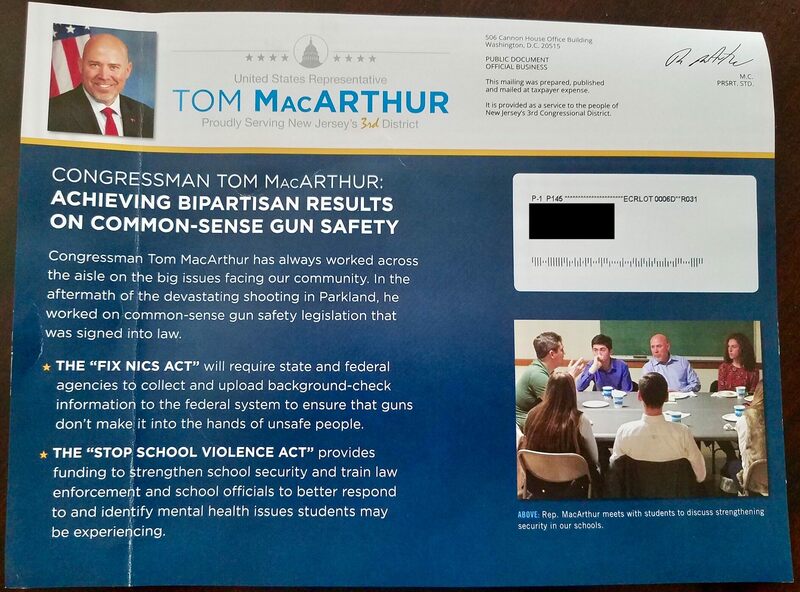 MacArthur’s actual record – his non-support for true gun legislation – is, however, shameful. That “support” largely consists of proposals requiring the (many non-gun supporting) taxpayers to provide funding to pay for additional security personnel and to train school officials how to properly use weapons to defend the students. This is lunacy at its worst! True common-sense gun legislation must include the total elimination of access by the general public to assault weapons, period! Probably the biggest lie in the mailing is the statement, “Representative MacArthur Wants To Hear From You!“ I can assure you first-hand that this is a blatant falsehood, supported by both the fact that he has not held a town hall to meet with all of his constituents in nearly 14 months. Apparently, unless you are a donor to his campaign coffers, you are not worthy of his time. Rep. MacArthur has a 93 percent approval rating with the NRA for a reason. For that reason, and very many other reasons, I look forward to voting for his opponent, Andy Kim, in November.